SYMPTOMS: After installing, using the "Guided partitioning using full disk with LVM Encryption", the installation completes normally. Remove the cd, as the system restarts. When the grub menu appears, the entry is blinking. As the timer counts down, the system appears to continue to start, but the screen goes black and remains black in all TTY's. The monitor has not shutdown, but the screens are black with no prompts. 2. 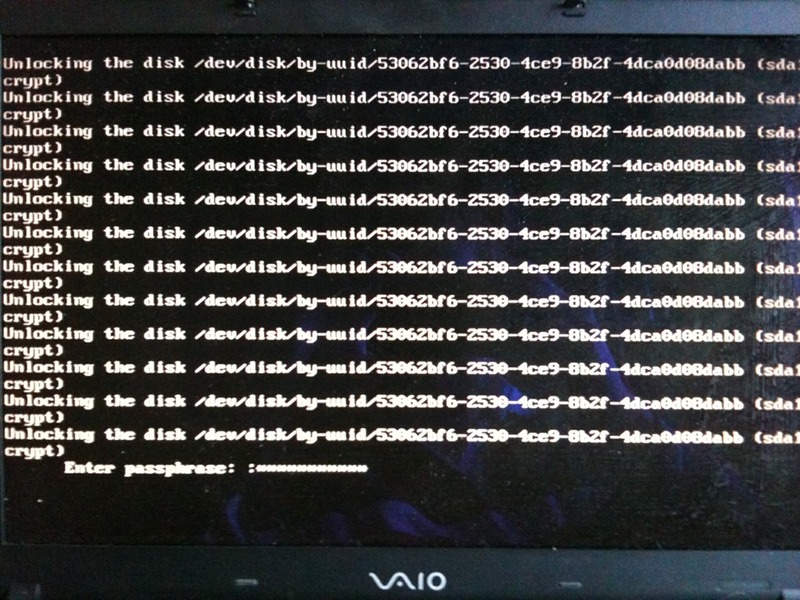 Partition using Guided, full disk, using LVM with encryption for the partition menu. 3. Allow the installation to complete. 4. Restart when it tells you to. 5. Observe the Grub menu and watch the monitor go blank. The installation never asked for the PassPhrase, and perhaps it is hung waiting for input. It is not possible to tell with no prompts. Since it is an encrypted installation with no prompts, I can not get the log files. Reassigning this to plymouth as a first pass. What video chipset do you have in this system? If you boot without 'splash', do you get a text prompt? Running without 'quiet splash', I don't get any prompt on the TTY it starts on. I am, however, able to switch to Alt+F1 and see it ask for the passphrase. Thanks. I never thought of that. Also affects Ubuntu Server. The workaround works here as well. No; bug #496765 is about the fact that the *text* passed as the --prompt argument to plymouth is not displayed. This bug (which I've just reproduced by passing i915.modeset=0 on the kernel commandline) is about getting a completely black screen with plymouth. Should plymouth work on non-KMS video currently? Ok, I misread the description then. As regards non-KMS drivers, plymouth should still work thanks to the vgafb16 module. Any ideas as to why this doesn't work? Can someone with an affected system check what framebuffer (fb*) modules are loaded after boot when booting without 'splash'? What does /proc/fb show? This should be 'cat /proc/fb', not 'sudo /proc/fb'. I did a complete install on the same system that I used for ISO testing. I am including the install logs and lspci results for your consideration. Let me know if you need any other logs. The installation will sit until after the bug is resolved. > This should be 'cat /proc/fb', not 'sudo /proc/fb'. > shutdown, but the screens are black with no prompts. > 3. Allow the installation to complete. > 4. Restart when it tells you to. > 5. Observe the Grub menu and watch the monitor go blank. > an encrypted installation with no prompts, I can not get the log files. I can confirm that Plymouth shows nothing but black on my system, which is using the nvidia-current drivers for its Nvidia Geforce 9600GT graphics card. However, when the moment arrives that ureadahead is killed, or when error messages are shown the black screen goes away and you see the lines of white text we wanted not to ruin our wonderful boot experience. However, GDM is loaded after a while, so my issues may be unrelated. If I should attach more information, please ask and I'll post it. The output of 'cat /proc/fb' here is "0 VGA16 VGA", just as the original reporter's. certainly not 'triaged', we still have no idea what's going on here. This is noteworthy because it appears the frame-buffer renderer does work when the framebuffer is intel, it just doesn't work when it's vga16fb. Will continue working on debugging this, and will reboot again with the drm renderer enabled to reconfirm that plymouth does work with i915.modeset=0. Sorry, it seems I misremembered. With the drm renderer enabled, i915.modeset=0 also causes plymouth to fail to show up. With the drm renderer excluded from the initramfs, but without passing i915.modeset=0, splash screen appears correctly. The net conclusion seems to be the same: the frambuffer renderer works with inteldrmfb, but not with vga16fb. Since vga16fb is, by definition, less than 16 bpp (vga16fb = 16 colors = 4 bit indexed), if this is the only framebuffer available, the plymouth framebuffer renderer won't work. As already noticed in the duplicate bug report, booting with 'vga=<mode>' also works around this issue by forcing the use of the VESA fb instead of the VGA16 fb. That's not suitable as a solution for this by default on users systems, however. The text fallback wasn't working because the script plugin, despite having no support for non-framebuffer output, wasn't telling plymouth this. I've applied a patch to bzr that fixes this. I'm not sure if we should consider this bug closed, or if we should be targeting getting plymouth running in GUI mode on vga16fb systems. I'd go for keeping this bug as getting something usable -- text mode in this case -- for vga16fb systems and file a separate bug for getting something visual working on that fb, especially since it seems a lot of work to me to port the code to a new colourmap. By the way, I'm pasing the 'vga=' argument, but all that changed is that now Grub2 warns me that the argument is deprecated in favour of gfxpayload, which cannot be set in /etc/default/grub -- that is a bug report somewhere, not sure if also on LP though. I still don't have a proper boot splash. I agree; considering this fix complete. It's not obsolete at the kernel level. Where are you adding this vga setting? It should be added to the "GRUB_CMDLINE_LINUX_DEFAULT" setting; see https://help.ubuntu.com/community/Grub2 for information about configuring grub2. I've added "vga=0x0369" to the argument list in GRUB_CMDLINE_LINUX_DEFAULT, nevertheless I do get the warning that it is deprecated. This is also what is said elsewhere on the internet, Grub2 has deprecated this boot option. I'll try the GRUB_GFXMODE option to see what it does. This problem is still present with nvidea graphics. This is marked as "Fix Committed", has the fix just not made it into the repos yet? The report also says that 3 people are effected, there are more than 3 people effected by this bug. I am guessing that most people just did not want to add a "me too" to this bug report. I am only posting to confirm that this bug is still present with nvidea graphics. exploder91: Fix Committed means indeed that the fix hasn't landed in the repositories yet. The status will be Fix Released when that's happened. The number of affected people is as low or high as the number of people who visited this bug report and told Launchpad they were affected as well. Sense Hofstede, I misunderstood the status of this before I posted, sorry about that. I am enjoying the LTS so much and I was just trying to do my part with the bug reporting. I will try to be more careful when it comes to reading the status in the future. Again, sorry for my mistake and thank you. cecilpierce: Please don't change the status without knowing what you're doing. It was set to Fix Committed because a fix is committed but still pending or not in the repositories due to a different cause. When it will be set to Fix Released the fix should be in the Lucid repositories and then you could properly say if the fix works or if it doesn't. However, even then the status doesn't have to be Incomplete since we've already confirmed the existence of this bug. exploder91: Don't apologise for not knowing something! You did nothing wrong and we can't expect someone to know right from his/her birth how we use the different statuses. Thanks Sense Hofstede! I have a better understanding of the status now. I see some outstanding work in this release and just wanted to be sure what was happening with this issue. The system boots up so fast that Plymouth is not going to displaying very long anyway. This release is pretty easy to get exited about, it is really nice and there is still a lot of development time remaining. I honestly have that thought in the back of my mind that this is that Windows killer system we have all thought about for years. Yes, I think it is that good! initramfs unless we know it's needed for prompting (e.g., cryptsetup). server install by default. LP: #509579.
return an error so that plymouth can fall back to the text plugin. plymouth uses these as built-in fallbacks and they're tiny. * don't let the password walk off the end of the dialog box. LP: #496782.
these are now guaranteed to be available; copied from gdm upstart job. * Depend on mountall (>= 2.0) to ensure we have the above guarantee. otherwise initramfs-tools skips it. LP: #509487. Black screen at startup the fsck messages etc then GDM. do you have the 0.8.0~-8 version of plymouth installed? philinux: actually you're not. You're running Plymouth '0.8.0~-7', whereas the version that should work is Plymouth '0.8.0~-8'. It's in the last number. @Sense, I could see that I'm running an older version but lucid is fully up to date. Where does the 0.8.0~8 version come from. The '0.8.0~8' version comes from Steve's reply and the changelog that was posted in this bug report. The fact that you couldn't update to the latest version was probably caused by the latest version not being synced with your repository yet. It takes a while before packages reach the archives after they were built on Launchpad. As the original reporter on this bug, I can report that I now get a prompt for the passphrase. After installing, using the "Guided partitioning using full disk with LVM Encryption", the installation completes normally. Remove the cd, as the system restarts. When the grub menu appears, the entry is blinking. After entering the passphrase on a black screen with no prompts, the system did boot to the gdm screen. I logged in to the desktop and applied all the updates. I then restarted. Unfortunately, the screen begins to scramble after entering it, and the gdm prompt no longer comes up. Instead, I get a screen with about divisions on it, that I can see. I logged in to a tty, and plymouth is now '0.8.0~-8'. Am I now seeing a new bug, and if so, is it because of this change or another one? Just to verify, I also did this installation in a VirtualBox, and it worked. I could also log in through gdm after the updates and restart. I also installed without encryption and failed to get the gdm screen after updating. Let me see if I've understood right - after upgrade to plymouth 0.8.0~-8, you do correctly get prompted for the passphrase on boot, which didn't work before; and then the screen is messed up afterwards? I guess that will be a new bug. When you do see the prompt for the passphrase, what does the prompt look like? Is it text-only? Sorry, just realised I didn't have splash on my grub command - running with splash enabled it works as expected - the above behaviour is not plymouth related. No plymouth at startup. Fsck messages then corrupted sort of blue/white progress bar at bottom of screen. Locked up solid at gdm had to reisub and reboot twice to get in to desktop. Using the terminal causes a hard freeze too. This is after purging and reinstalling plymouth too. Terminal has decided not to lock up solid this reboot. Had to chroot in to lucid and purge plymouth. It was causing a hard lockup on logging in at gdm. Recovery mode hangs at resume normal boot. I can now boot into lucid with no problems. Yes, it is two lines, and there are two colons after passphrase, with a space in between them. This is more or less centered on my screen, from top to bottom(displays in the middle of the black screen). The rest of the screen is blank. No plymouth at startup. Fsck messages then corrupted sort of blue/white progress bar at bottom of screen. The blue/white progress bar isn't corrupted, it /is/ plymouth. You do have plymouth at startup; you don't have a graphical splash screen at startup, because the nvidia driver doesn't expose a framebuffer that plymouth can use to display graphics. The latter is an issue that should be addressed, but is separate from not getting *any* feedback on nvidia chips. Re my post #51. Any idea whats causing the hard lockup? Also is the bug status wrong now. Not really; plymouth shows up; it does not work, but it is shown, so this bug is fixed. We need to file another bug for this. I don't have time now, can one of you do it and link it here, please? My problem namely the gdm lockup on pressing the enter key to login can be got around by alt+SysRq+k then login again. The GDM lookup problem is discussed, if I'm not misunderstanding, in bug #516412. Thats the copy and paste bug again at work. Seems to paste a previous copy. Bug 516412 was linked in post #53 which is what I was supposed to be pasting. > Thats the copy and paste bug again at work. > is what I was supposed to be pasting. No properly working plymouth on my ASUS laptop running proprietary nvidia drivers. Have the same problem like Fred and probably chillshock with the blue/green/white bars on the bottom. You can subscribe, to get informed when it gets changed. What about ATI cards? I have an ATI Radeon 4850 with the open source driver.I dont see nothing. Rajeev Nair: Have you filed a new bug for that? This was determined to be NVIdia and Plymouth, and has been fixed. 0.8.0~-17 and black screens too. On boot I see GRUB menu, then "Starting up..." and then GDM login screen appears. No bootsplash. When I shutdown new shutdown splash appears. I have a couple systems that I work on which this is still an issue on. I can confirm that this issue is fixed in Lucid for Nvidia when you're using the closed driver. Chaostya: this bug report is for Nvidia, you're using Intel. Rajeev: same for you, but you're using ATi. Those errors belong in different bug reports. By the way, hikaricore, comments like "Fix plymouth..." are not really helpful. I hope you can see why. "Step 1: we must edit the /etc/default/grub file. Step 2: edit the /etc/grub.d/00_header file. Once you complete the above steps, restart the computer and you should see the nice Plymouth screen like in the screenshot in the beginning of the post." I'm still seeing blue progress bars instead of a nice plymouth splash... If I revert the changes, do you guys think plymouth should work? Or what can I do to fix that? Oh, sorry for the last post... i should have put that on bug 526892 and not this one. I've got the latest Lucid update (Beta2, updated approx Mon Apr 19 22:41:00) with Plymouth 0.8.2-2. My GFX is a GeForce 6200, and the above problem still persists with this setup. The status of this bug is "Fix Released"
Is there any logs/data that I could add that would be helpful? I can confirm that the bug is still not fixed. Bug still not fixed, got the same problem. This fix worked for me. From a vanilla install. Instead of 12 seconds of blinking black cursor before plymouth I now have a smooth boot experience. The fix for the resolution was this for me. The resolution chosen should be your monitors native resolution. #77 does not work for me, I am using the driver directly from Nvidia rather than the one in the repos if that makes any difference. #77 Doesn't work with the latest nvidia drivers either. Nicolas which driver are you using? Booting seems to take longer in 10.04 than it did in 9.10...but it may just be more flickery and in worse resolution. I've tried and undone every work around I can find. Would be great if a proper fix was released for this soon. nothing works for me too. 8400GS, booting I get "Input not supported". drivers from repos. I'm using NVidia driver (195.36.15). Plymouth is displayed correctly, but I only got a black screen after it disapears. GDM only appear if I press ctrl + alt + f8 and go back to X with ctrl + alt + f7. All the virtual terminals (ctrl + alt + 1,2..) are with the fonts messed up. I've found an workaround: adding "vga=792" at the end of the entry in /boot/grub/menu.lst (i'm using the old Grub, i've dist-upgraded since hardy, passing by all releases). With that change, GDM appears correctly, the virtual terminals are ok and plymouth doesn't stays ugly (now it's displaying correctly, with Ubuntu logo. Before that, it was a purple screen with "ubuntu 10.04" written on it and a progress bar). I'm seeing some people (with Nvidia cards) suffering with that problem too. Never saw plymouth at all on boot or shutdown just a few colored pixels at the top of the screen and when a disc check was being done there was no message at all just a minute longer of black screen. Using fix #77 fixed these problems. Missing packages were installed, I now have plymouth. With fix #77 plymouth was visible, but the grub menu wasn't. Error in #80. Should have been. Grub is visible, plymouth is visible during boot (I haven't checked shutdown, yet), and text consoles are visible. Solution #77 was helpful for me. Thanks. Why this solution still not in Ubuntu? Solution # 97 works for me.